In honour of the International Day of Indigenous Peoples on "Indigenous Peoples’ Migration and Movement", Docip has the pleasure to share with you our last publication. 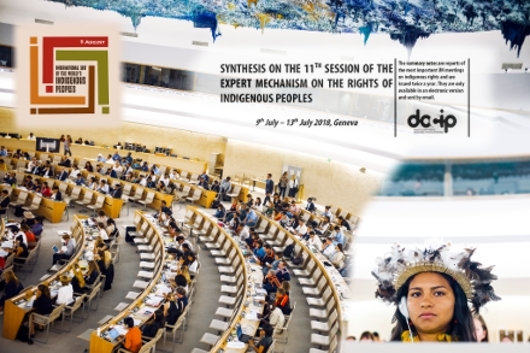 The Synthesis on the 11th session of the Expert Mechanism on the Rights of Indigenous Peoples (EMRIP) relates all discussions that happened during the conference. The EMRIP study under discussion was the right to free, prior and informed consent of indigenous peoples, and further discussions were held on the first country missions of the EMRIP under the new mandate; panel discussions on recognition, reconciliation and reparation; indigenous traditional knowledge and UNDRIP implementation. This Synthesis also comprises in its last part summaries of all side-events that took place during the conference. As this is my last Docip Synthesis to endorse new responsibilities within Docip, I would like to address many thanks to the team for their hard work on this publication: Ms. Héloïse Servettaz (volunteer), Ms. Héloïse Creon-Plaquin (volunteer), Ms. Joëlle Klein (volunteer), Ms Leyla Babayeva and Mr. Ivan Gorovenko (translation in Russian), M. Alberto Sanz (translation in Spanish), Ms. Clémence Berger (translation in French), and Ms. Mary Holihan (proofreading in English).